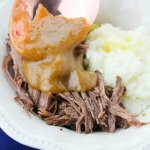 This Instant Pot Mississippi Style Keto Pot Roast is so tender it melts in your mouth! A comfort food classic made keto-friendly but every bit as flavorful! It’s been cold and rainy here in Texas this week, though it’s nothing compared to the Polar Vortex half of the country is experiencing! On days like this, nothing warms the belly like a tender, juicy pot roast. Even better is how the house smells when it’s been cooking all day! 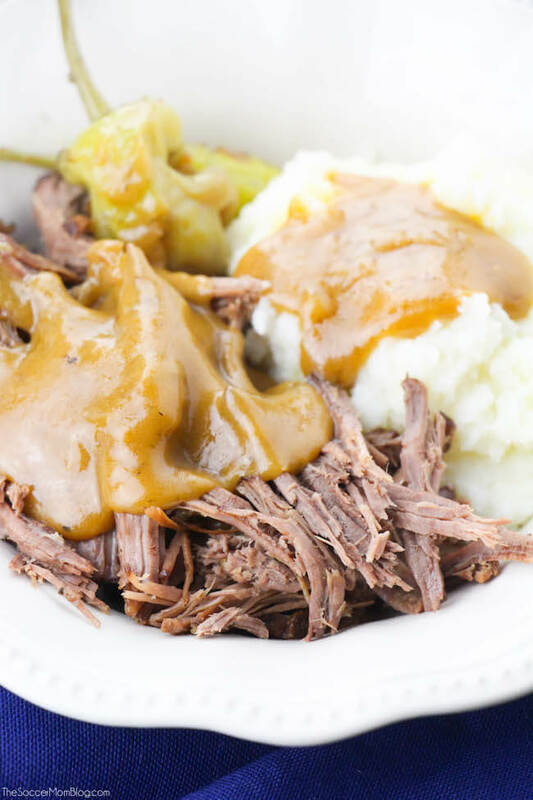 We made a keto-friendly version of the classic Mississippi Pot Roast that won’t take up all your carbs for the day AND it’s ready in a fraction of the time using the Instant Pot! 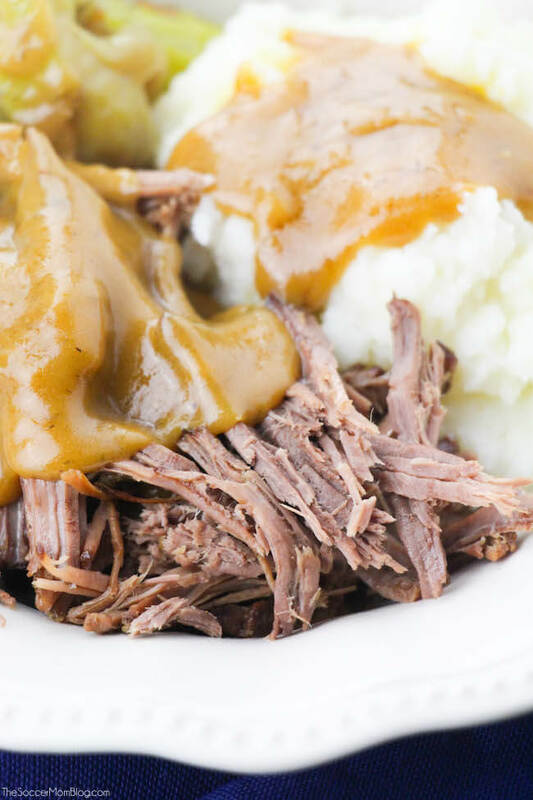 This Keto Mississippi Pot Roast is next-level comfort food! Perfect Pairing: Serve our Mississippi-Style Keto Pot Roast over our easy cauliflower rice! 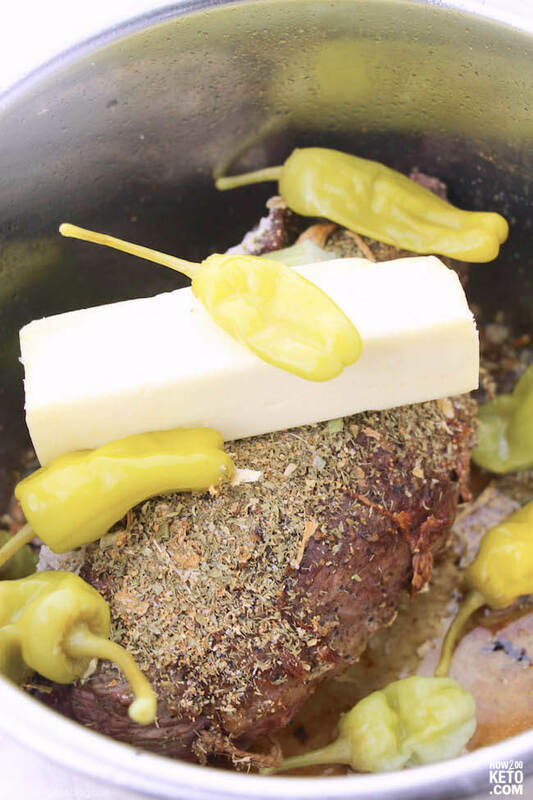 A traditional Mississippi Pot Roast is a boneless chuck roast, slow cooked with a stick of butter, pepperoncini peppers, and ranch dressing powder until it’s so tender it practically falls apart. Normally you’d serve your Mississippi Pot Roast with au jus gravy, though we enjoy ours with tangy Chimichurri Sauce (zero carbs!) Though, if you prefer gravy, we have a low carb gravy “hack” in the prep tips below! Since ranch dressing mix often contains sugar and other additives, we used our own simple spice mix for this recipe. 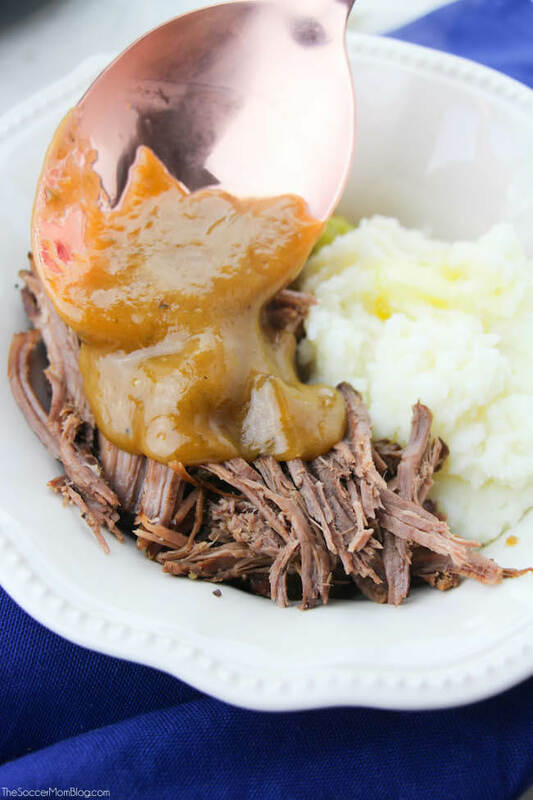 The result is a flavorful, melt-in-your mouth pot roast that’s only 1 gram of carbs per serving! 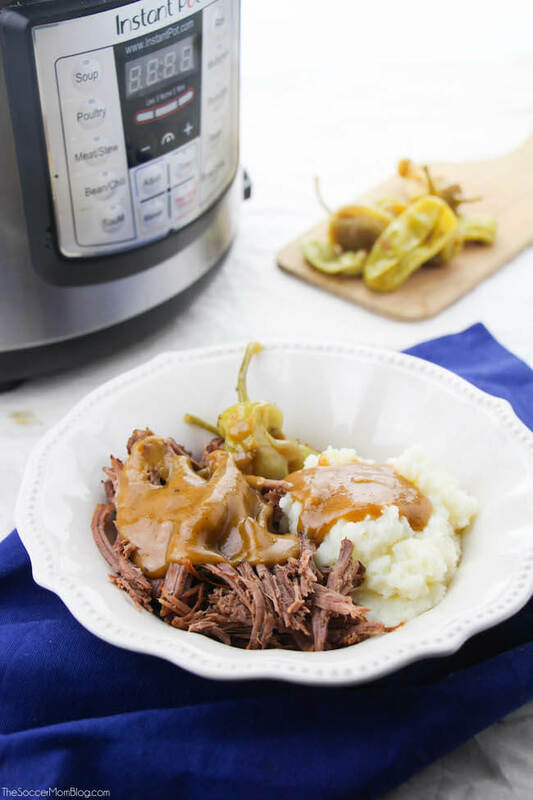 Finally, we opted to cook our Mississippi Pot Roast in the Instant Pot (as opposed to the slow cooker) because it’s a lot faster, and just as tender. So juicy it literally melts in your mouth! 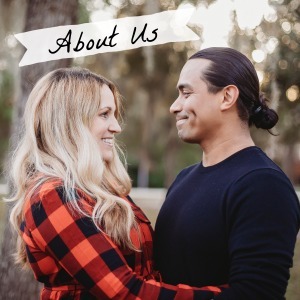 For your convenience in re-creating our Keto Pot Roast recipe at home, we’ve included shop-able ad links to some of the products and supplies used. Read our disclosure policy here. 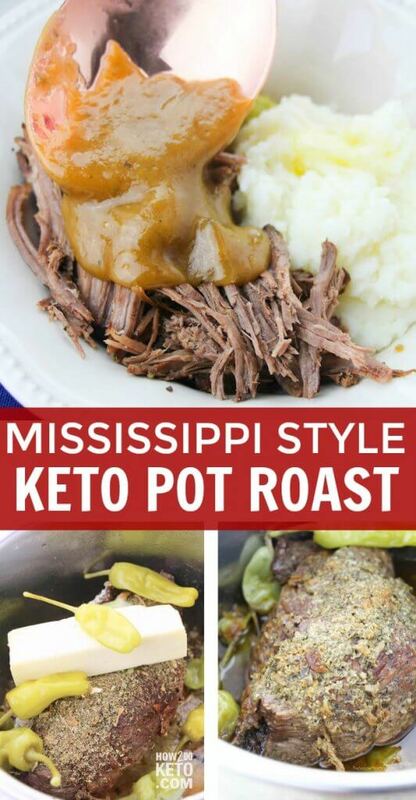 The above is a quick glance at the ingredients and tools needed to make Keto Mississippi Pot Roast. Full ingredient amounts are available in the printable recipe at the bottom of the post. Chuck roast is our favorite to use for Mississippi Pot Roast, though you can use your favorite cut (or whatever you might have available). 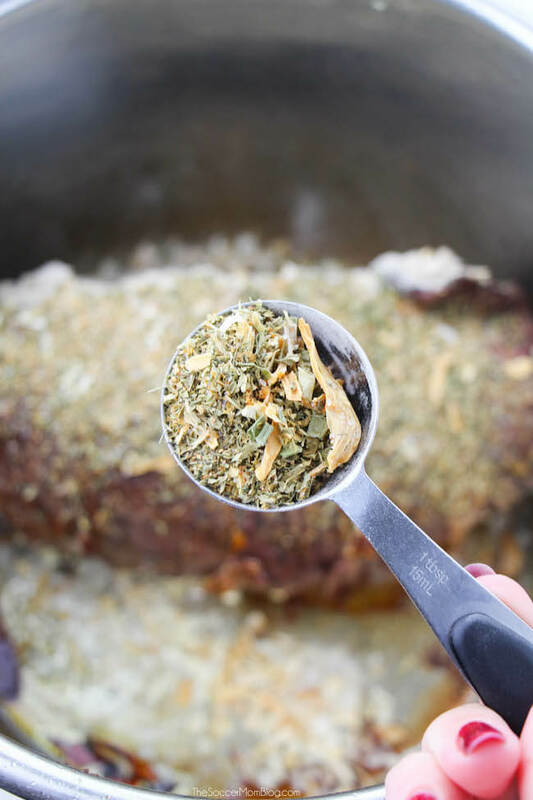 Traditional Mississippi Pot Roast uses ranch dressing mix, but we made our own simple spice blend so we’d know exactly what’s in it. If you want to use ranch dressing powder, be sure to check the ingredients first for added sugars. To make a low carb au jus gravy, whisk together 2 – 2 1/2 teaspoons arrowroot powder with 1 cup of juice from your roast until it begins to thicken. Gravy made with arrowroot powder is best enjoyed right away, so this is one step you don’t want to do in advance. You can learn more about using arrowroot powder to make gravy here. Rub the pot roast with a generous amount of salt and pepper. Place the 2 Tablespoons olive oil or butter in the instant pot and select the sauté setting. When the pot is hot and butter is melted, sear the pot roast on each side (about 2-3 minutes on each side) until well browned. Turn off the Instant Pot and add all seasonings on top of the roast. Next, add the pepperoncini peppers and pepper juice. If your pot roast didn't produce much juice, you may want to add 1/4 cup of beef broth or water. Add a stick of butter (1/2 cup), seal the Instant Pot, and set for 55 minutes on "meat/stew" setting. When your pot roast is done cooking, use either natural or quick release.